During the past two weeks I was on vacation in Italy with my wife and daughters. We spent a few days in Naples, and then went to the Amalfi Coast, where medieval towns with tourist-packed beaches sit nestled between cliffs soaring above the blue Mediterranean. Before leaving France we took the risk of reserving an apartment by Internet. Arriving in Amalfi we discovered that our lodgings were several kilometers out of town and perched high above the sea, with no less than 700 steps to walk down to get to the beach – and to climb back up again. We learned to take the local bus to get around, and enjoyed the majestic view from our villa. I brought along my Asus 3e computer, which belongs to the genus subnotebook and the species netbook. The cluster of apartments was equipped with wifi, but it took me a while to figure out how to get the Internet connection. So I had a few days of down-time in which to reflect on my main internet project, which involves making technology more accessible to everyone. I've been long searching for a way to promote the ideas that Ivan Illich set out in his book Tools for Conviviality. 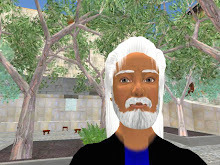 I once began discussing lllich in an earlier post on this blog, titled Fools for Tools, but then I got sidetracked into Second Life obsessions such as CDS politics and OpenSim. I finally got back to Illich during the journey in Southern Italy. As I mentioned above, the first stage of our trip was a few days in Naples, a city which most tourists flee, stopping there only long enough to visit the archeological museum with its collection of ancient relics. But I had my own particular motives for wanting to spend a bit of time there. I'm fond of Baroque architecture, and Naples is full of run-down examples thereof. Also, my leftist sympathies for the downtrodden masses drew me to this bustling southern port, teaming with poor workers, street peddlers and immigrants. And then Naples was the home of one of my favorite authors, Giambattista Vico, an eighteenth-century philologist who revolutionized the study of history and initiated modern hermaneutics. Through meticulous analysis of ancient texts, Vico showed that most Greek and Roman myths were thinly-disguised allegories of class struggle. For example, he wrote that the western dragon generally represents the laboured earth, the dragon’s scales being rocks in the fields, and the fiery breath an allusion to the agricultural practice of using fire to clear land. By extension, the dragon also represents the peasant class that labours the earth, and the Herculean hero or medieval knight that kills the dragon represents a leader of aristocratic land-owners who crushes a peasant revolt. In the modern industrial welfare-state, popular myths take other forms, such as glamorous stories of stars, champions and popular idols, but the basic theme is the same. Our myths still generally celebrate the victory of the strong over the weak, and thereby justify the monopolization of wealth and power by an elite minority. When I was younger I embraced the goal of an egalitarian society. I've since become convinced that strict social equality is a totalitarian ideal. I now prefer the liberal philosophy of John Rawls, who developed a more subtle Theory of Justice which takes into account the economic need to reward personal initiative. Rawls' theory says that we should accept inequality as long as the gains of the wealthy bring benefits for the least-advantaged members of society. But let me get back to Illich. In Amalfi when I finally got hold of the wifi code and tried to connect to the Internet, my Asus kept giving me failure messages. I eventually figured out that it takes the Asus about ten minutes to establish the wifi connection, and I wasn't waiting long enough. Now each time I encounter some such technical failure, I think of Illich and his theory of convivial tools, because I believe we could design a new type of tools that would minimise the occurrence of user helplessness. A "convivial" tool empowers the user, by providing a friendly interface and a useful help function, but also by allowing the user to tinker with its inner workings, and thus fix – or at least clearly identify – what is broken. The wifi function of the Asus 3e failed on these counts, despite the fact that my Asus has a Linux operating system. Way back in the early nineteen-seventies, Ivan Illich described a process whereby tools would be developed by a community of users. Such a participative process can nowadays be seen at work in open source software development. But few people realize that the first personal computers were also created through a process of community tool development. Illich's vision of a community of do-it-yourself tool developers was taken up by pc pioneer Lee Felsenstein, and provided the explicit model for the Homebrew Computer Club, whose members made the first functional personal computers, including the first Apple computer. The thirty years that separate us from the invention of the personal computer have brought exponential growth in all aspects of computing: capacity of chips and storage, the web, search engines, high bandwidth, collaborative sites including wikis and social software, and open source software. The type of collaborative tool envisaged by Illich has become so widespread that Illich himself might now seem irrelevant. My personal concern is less with ensuring user participation in tool development, than with ensuring that the user has easy access to the inner workings of tools, and can tinker with and fix them. For software tools, such access is best provided by making programs open source. For other types of tools, access to the inner workings can be provided by designing the tools such that the user can easily disassemble and reassemble them. I'll wait for another occasion to explain why it is revolutionary to design tools that can be easily disassembled. For the moment, let me describe how I plan to use Second Life to promote convivial tools. I'm currently setting up shop in a small street going North from the main plaza of the Colonia Nova sim. However, the shop, which I've called Danton's Tools House, is still rather empty. In the eight months since I discovered Second Life, I've been too busy with Second Life blogs, CDS, Twitter, Plurk and OpenSim to learn well the rudiments of building, let alone scripting, baking textures, or making animations. So far I’ve made a wall with a doorway in it, at the entrance to my shop, and an upper floor that serves as Danton's Workshop - which is the closest thing I've got to a sandbox. My goal is to fill this non-profit storefront with exhibits related to in-world tools, but so far I've little to show. The shop is also supposed to present a sign with a link to the Danton's Tools House Website. I installed the Joomla website package on a hosted server, but I must learn to use Joomla before I can announce the link to the site. At present I'm trying to figure out how to put an image into the default Joomla page header. There is a new version of Joomla that makes this easier, but I want to learn how to use the older version, so that I will understand how the Joomla pages are constructed. The initial idea for the Tools House Website was to present tools and other resources for residents of Second Life. This would include tutorials, lists of useful links, recommended places to visit, and so on. Such sites already exist, and would be linked to, but the Tools House site would aim to be a showcase for a specifically Illichian approach to providing open source access to Second Life tools and resources. The problem of course is how I will find the time to assemble all that information. I would ultimately want to go beyond tools for Second Life, and present information on the website about all sorts of other tools. I might assemble hints and useful links about using social sites such as Facebook, Twitter and so on. Then there is the idea of providing help and information about using the main open source software packages. You can download the software from sites such as Sourceforge, and find detailed information about the programs on Wikipedia, specialized sites or, in the last resort, on various forums. But Wikipedia strives for objectivity and exhaustiveness, which prevents subjective presentation of useful, targeted advice. And the specialized sites for specific software packages tend to be oriented to users who are already experts. So there is still a need for general resource sites aimed at the average software user. Going still further abroad in the realm of tools, beyond software and the Internet, there is the vast domain of physical tools and machines. I've long dreamed of promoting a selection of easy-to-repair household appliances. These appliances would be designed to last as long as possible, with a guaranteed supply of spare parts easily ordered by Internet. They would also be designed for easy disassembly by the user, for easy repair by the user during the machine's useful life, and for recycling of the components at the end of the life cycle. Such appliances would probably cost more than the disposable type, but should appeal to a minority of do-it-yourself and environmentally conscious consumers, like myself. Ideas can also be considered to be a form of tools. Another of my projects was to promote the design of "open-source idea systems," assemblies of concepts that could be adapted and maintained in the same manner as other convivial tools. The personal vision that lies behind this particular project is hard to explain, but it is another application of the general idea of conviviality. As noted above, these various ambitious projects far surpass my individual capacities. An appropriate format for these projects might seem to be a collaborative website such as a wiki. But a wiki implies a group, and at present I am still alone. Moreover, wikis are susceptible to a variety of problems, such as weak editorial direction, spamming, trolling and self-serving promotion of products or websites. It thus seems preferable to find some other format, collaborative if possible, which would permit the development of a clear editorial line oriented towards Illichian conviviality. What I am really looking for is some way to work with others. But as Billy Holiday sang: "God bless the child that's got his own." Balanced collaboration results when each participant has their own garden to cultivate. So I'll keep on doing my own thing, hoping that someday I can find a way to do it with a group.